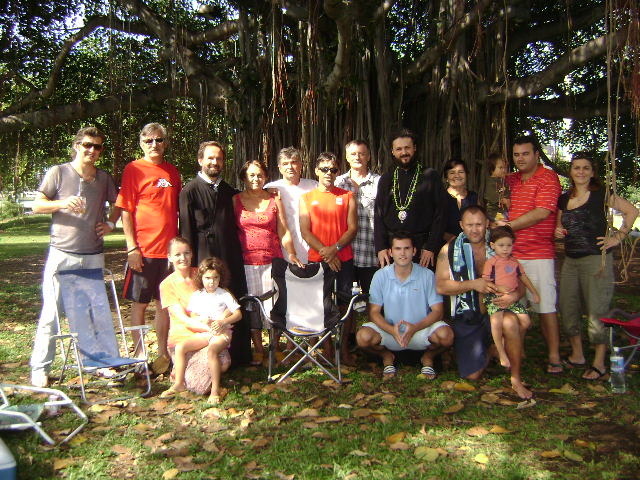 Honolulu, Hawaii - The Serbian Orthodox community, the mission parish of St. Lazar of Kosovo in Hawaii, during the days of the Lord's Ascension, had the opportunity to partake more fervently in the divine services which were officiated by His Grace Bishop Maxim of Western America, assisted by V. Rev. Blasko Paraklis from the Orange County parish and long time administrator of this community. On Saturday, June 3 the Divine Liturgy was served at the Holy Theotokos of Iveron Russian Orthodox Church and on Sunday, June 4 at the Sts. Constantine and Helen Greek Orthodox Church in Honolulu, with the concelebration of the local clergy. Each visit of a Serbian bishop or priest is a true joy for our countrymen who, though they live in the beautiful nature and ideal climate of Honolulu still feel a great distance from their home country. It is only the Church which is able to overcome the barriers, to bring them closer to God's Kingdom and thus, to maternal Serbia, through prayers and homilies in their mother tongue. Following the meal and fellowship at the Greek hall after the Divine Liturgy the Serbian parishioners went to Ala Moana Park for an afternoon picnic with Serbian barbeque and music. This is a historical place for the Serbs of Honolulu. Namely, the parish was formed here in the now distant year of 1990. On that occasion each parishioner brought one icon which were placed around the great tree in which way they might conjure a Serbian-Orthodox ambiance. After a lecture delivered by Blasko Paraklis, ther representative of the Western American Diocese a discussion followed about forming a parish. When Blasko asked to which Saint should the community be dedicated the icon of St. Lazar the Great Martyr of Kosovo moved and fell on the ground. Everyone took this as a sign and easily decided to whom to dedicate their liturgical-prayerful community. Today nearly 70 Serbian souls reside in Honolulu, mostly families. There is great hope in the fact that in recent years many children were born who can be the future of our community in the beautiful state of Hawaii.